Europe is small compared to other continents. Geologically, Europe is a smooth area without steep mountains, in comparison to mountains of other continents. The latest mountains that were formed during the recent geological evolution of our planet, are sharp and bigger because they haven't suffered great corrosion. In Europe appear all the gradations of the corrosive geological process because its segments formed at different geological periods. This is why Europe's terrain shows such a great diversity. According to the newest geographic data, the oldest parts are the Baltic and the surrounding countries , along with the European part of Russia, the southern part of Scandinavia, the bottom of the Atlantic ocean and north and northwest of the British Islands. 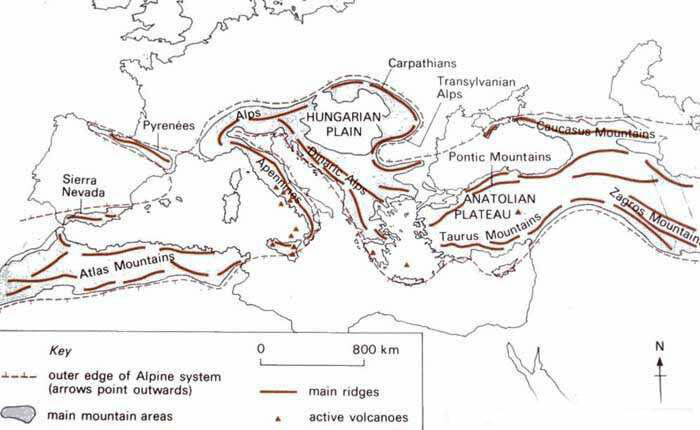 This is the Ancient Europe formed before the Paleozoic century. In other words, at least 550 to 600 million years ago. No later than 450-500 million years ago, Paleozoic Europe was formed. Meaning the major part of the British Islands, the north part of Scandinavia and the coastline from Netherlands to Poland. After the first half of the Paleozoic century, central Europe began to form. South England and almost the entire Iberian peninsula. 60 million years ago, the Alpes formed. The process took almost 40 million years to complete. It was then when the high mountains of southern Europe were formed. The Alpes in the center, the Pureness in the west and in the east, the mountains of the Balkan and the Italian peninsulas. The genesis of Europe includes and other secondary changes due to the movement of glaciers in the coast, because of river flows and the meteorological conditions. Europe was divided into three regions. In northern and central-west Europe with medium height eroded mountains and large valleys in the south. In central and eastern Europe with vast valleys and southern Europe with mountains that reach near the sea along with few plains. Greece is in the southern Europe in the south-eastern edge of the continent. The southern edge of continental Europe in mainland is Punta de Tarifa in Spain. But if we take into account the sea and the islands, Europe's southern edge is the island of Gavdos south of Crete, one of the largest European islands. An additional element that makes Europe stand out from other continents is the length of the coast. The European coastline is mostly torn to pieces with 78.000 km in length. The Greek coastline covers 16.000 km. A significant feature is that 28% of European territory lies on peninsulas . The Scandinavian peninsula covers an area of 800.000 sq km. The Iberian peninsula 584.000 sq km and the Balkan peninsula, 468.000 sq km. The Greek peninsula the southern edge of the Balkans covers an area of 131.944 sq km. 7% of the European territory is large and small islands. Important part of this percentage belongs to the Greek islands, which are 9.835.